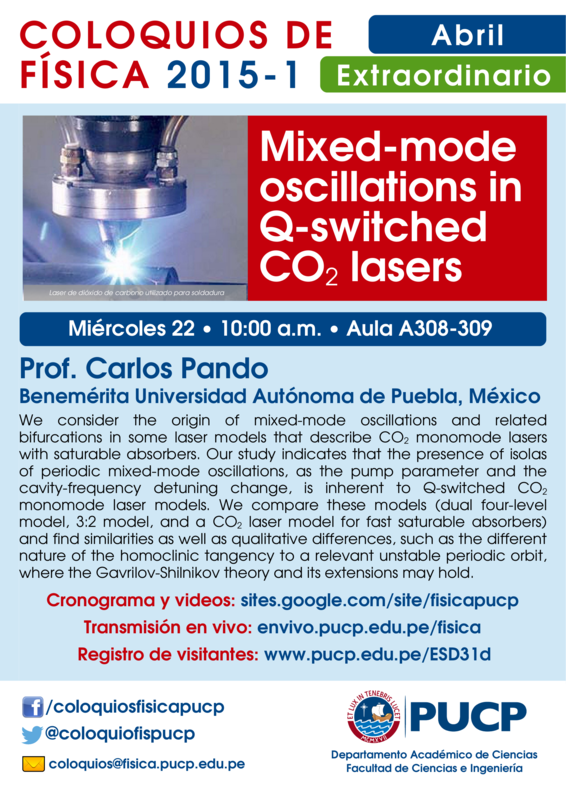 Ponente: Carlos Pando (Benemérita Universidad Autónoma de Puebla, México) We consider the origin of mixed-mode oscillations and related bifurcations in some laser models that describe CO2 monomode lasers with saturable absorbers. Our study indicates that the presence of isolas of periodic mixed-mode oscillations, as the pump parameter and the cavity-frequency detuning change, is inherent to Q-switched CO2 monomode laser models. We compare these models (dual four-level model, 3:2 model, and a CO_2 laser model for fast saturable absorbers) and find similarities as well as qualitative differences, such as the different nature of the homoclinic tangency to a relevant unstable periodic orbit, where the Gavrilov-Shilnikov theory and its extensions may hold.